Raphael Quartet: Ronald Hoogeveen – violin, Ramy Koch – violin, Zoltan Benyacz – viola and Henk Lambooij – cello. String quartet no. 2 in F major, completed by Julius Röntgen, String quartet no. 1 in G minor op. 27, Fugue for string quartet and Andante for piano trio. Raphael Quartet: Ronald Hoogeveen – violin, Ramy Koch – violin, Zoltan Benyacz – viola and Henk Lambooij – cello, with the cooperation of Jet Röling – piano. Olympia Explorer Series 1993, CD OCD 432. 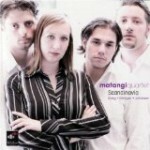 Matangi Quartet: Maria-Paula Majoor – violin, Daniel Torrico Menacho – violin, Karsten Kleijer – viola, Nander Cirkel – cello. (also string quartet op. 41 by Schumann and Rubens Quartet with works by Mozart and Louis Andriessen). Quartettino in A minor (1922).